MANILA, Philippines - President Rodrigo Duterte’s staunch critic Senator Leila De Lima has characterized the administration’s apparent disregard of law in its intensified war on drugs as “martial law without declaration” during a speech on Thursday, September 1. Criticizing the Philippine National Police (PNP) for the rise of killings of drug related personalities, De Lima said that the PNP is conducting door-to-door campaign inside gated communities without any search warrant. For the lady senator, the situation opens the country’s doors to becoming a “police state”, in which the government easily searches private communications and properties even without a court order. “I can only characterize such a situation as martial law without the formal declaration,” the former Justice secretary said. “Precisely in the name of this war on drugs, we are slowly but surely inching our way to the actual realities of a police state, where the government can look into your private affairs and visit you in your homes, even without any probable cause, without any search warrant, without any report or complaint against you or anyone of you in your households,” De Lima added. 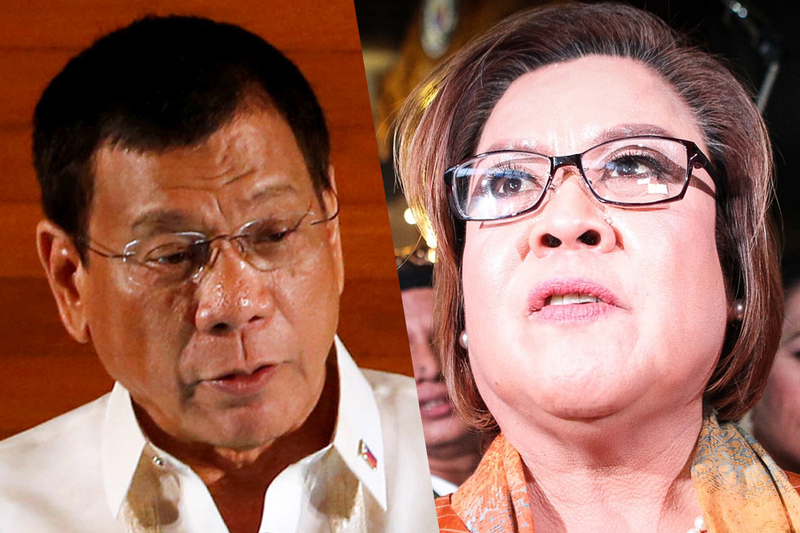 Duterte’s decision to bury former President Ferdinand Marcos at the Libingan ng mga Bayani is not surprising, according to De Lima. The former Human Rights Chair said the move is intended to make Martial Law acceptable and pave the way for a new dictatorship. In his campaign, Duterte promised to give Marcos a hero’s burial to heal the wounds of the nation during the 14-year martial rule despite public outcry against it, particularly human rights victims during the late strongman’s regime. De Lima formally joined the opposition to the planned burial of Marcos at the Libingan ng mga Bayani by filing her own petition on Tuesday, August 30, before the Supreme Court. "Ferdinand E. Marcos has the distinction of having the most number of ill-gotten wealth cases in the annals of Philippine jurisprudence, including that of his cronies. In almost all of these cases, this Honorable Court (SC) has affirmed forfeiture of his stolen and hidden wealth in favor of the government," De Lima wrote in her petition.